Hello everyone. I’m Icey Mee and you’re watching the I.C.U. News Network. We have THE scoop tonight on a story breaking in an undisclosed county jail. This picture was smuggled out by a disgruntled child who went to visit her father. We can confirm that the pictures are valid and that Mrs. 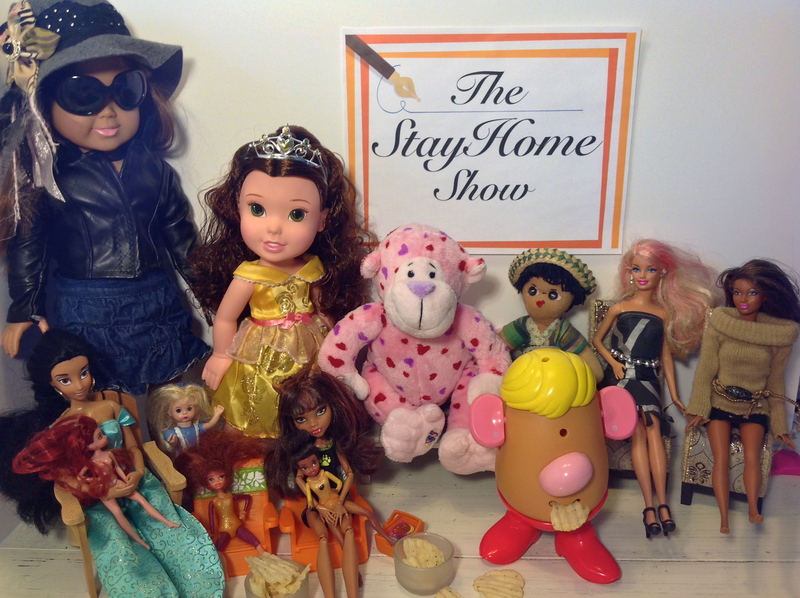 Potato has been arrested on child endangerment charges, as well as a host of other charges, after an appearance on the ‘Stay Home Show’ where she was seen eating the free chips. Authorities are telling us that although the chips were free, they were not for HER to eat as they are blood relatives. Mrs. 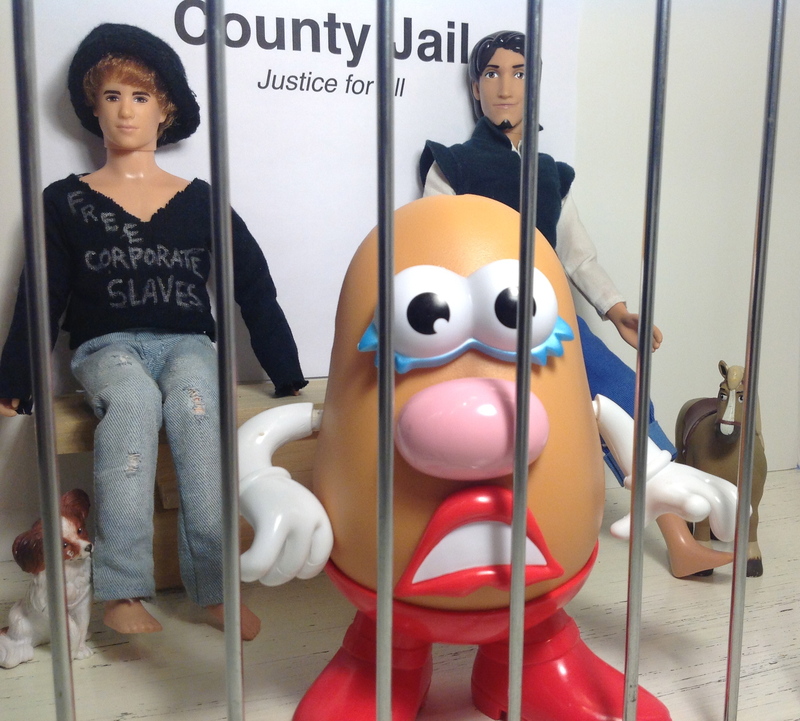 Potato was also booked on charges of theft, not having proper ID, and lending her arms to another person, which violates penal code #13452 in California. This code clearly states that the government or corporations shall have the right to borrow your arms but a family member shall not. It also clearly states that the government or corporation shall have the right to deny you healthcare, enslave you, starve you, jail you or bore you to death, but that the Parent, of said person, shall not. She faces a minimum of 13 years in solitary confinement for these 3 charges. Icey Mee is able to make phone contact with the child who smuggled the photos of Mrs. Potato out of the jail. Her identity will remain private as she is a minor. Icey Mee: Hello and welcome to the show. Why did you decide to take such a risk to smuggle out these photos? Child: I can’t take it anymore! First they arrested Flynn Ryder and Maximus…. (pause…child starts to cry). Tangled was my favorite movie! Whaaaa! Whaaaa! Boohoohoo. Boohoohoo. (Icey Mee waits for the child to be able to talk again). Then I saw that they were trying to take my chips away! I had to do something to stop this! Whaaaa! I love my chippies….Boohoo. Boohoo. Icey Mee: I can see that you are very upset dear. Child: Are they gonna take my dippy sauce next? Icey Mee: Well I certainly hope no one takes your chips and dippy sauce. Tell me, How did you get into the jail with a camera? Child: (She perked up a little bit). Oh! We all know how to do it. Our parents watch Lock Down. Icey Mee: Why were you at the jail? You’re just a little girl. Child: My dad is there. Icey Mee: Why is your dad there? Child: He said he was just trying to make a living. Icey Mee: It seems like you are more upset about your chippies and Flynn Ryder than your dad. Can you talk to us about that? Child: I am upset about my dad. But everyone says he is where he needs to be. I don’t get it…but I’m sure that Flynn Ryder and Mrs. Potato don’t belong there. Whaaa. Whaaaaaa. Boohoo. Boohoo…hoo. Icey Mee: Oh honey, don’t cry. You’ve done a very brave thing by letting us know that all of your favorite things have been taken away from you. Child: Boohoo…Is everything wrong? Am I going to jail too? I’m trying to be perfect but nobody believes me. Whaaaa. Whaaa. Boohoo. Icey Mee: It is true that many people in the place you live will find fault with you. But we at the I.C.U. News Network are going to help you. Sweet dreams. The conversation between Icey Mee and the little girl ends. Icey Mee: Welcome back to the I.C.U. News Network. Thank you for joining us tonight. The I.C.U. Network is putting out a call to help this little girl and the millions like her who have parents in jail. It’s time to STOP incarcerating our society. Everything is NOT a crime. Maybe it is an opportunity to see where things can be changed. Maybe it is an opportunity to look at our policies and practices regarding human beings of every race, religion, and color. Maybe it’s time to wake up and count the roses, most of whom in this country are in prisons and jails. Maybe it’s time to wake up and smell the torture of supermax prisons. I would be arrested if I treated my dog that way. Good Night. And a good tomorrow. Thank you for tuning in. Hello all, and welcome to the Stay Home Show. I’m your host, the Stay at Home Philosopher. Today we have a veeery special guest. Known and loved by billions all around the world. Whether you’ve run into him half baked, deep fried, or shredded, there is no denying the power of this starchy, tuberous crop. 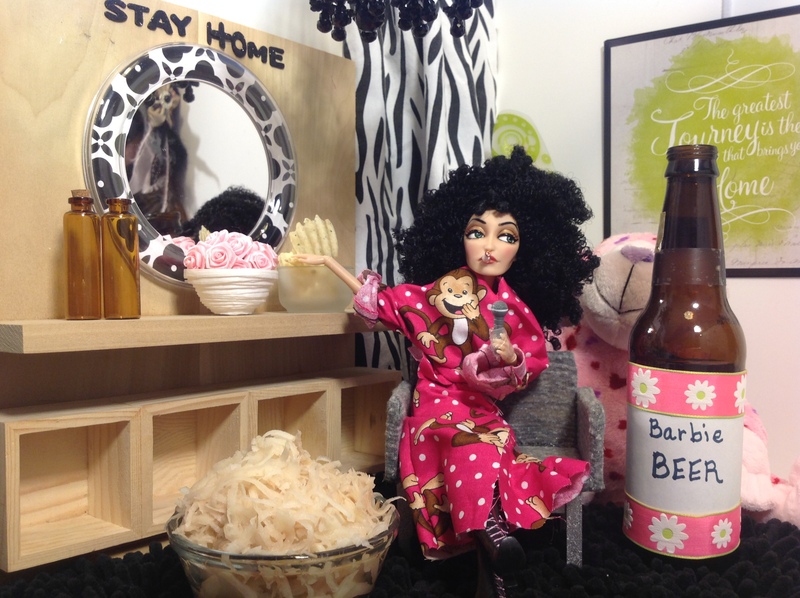 Soooooo, without further ado, (as she WHIPS the audience into a frenzy) please welcome Potato to the Stay Home show. The audience screams and shouts with joy! I know they may look calm to you, but I couldn’t figure out how to get everyone’s hands up at the same time. Trust me, they were ecstatic to see potato in his original form. Stay at Home: Mr. 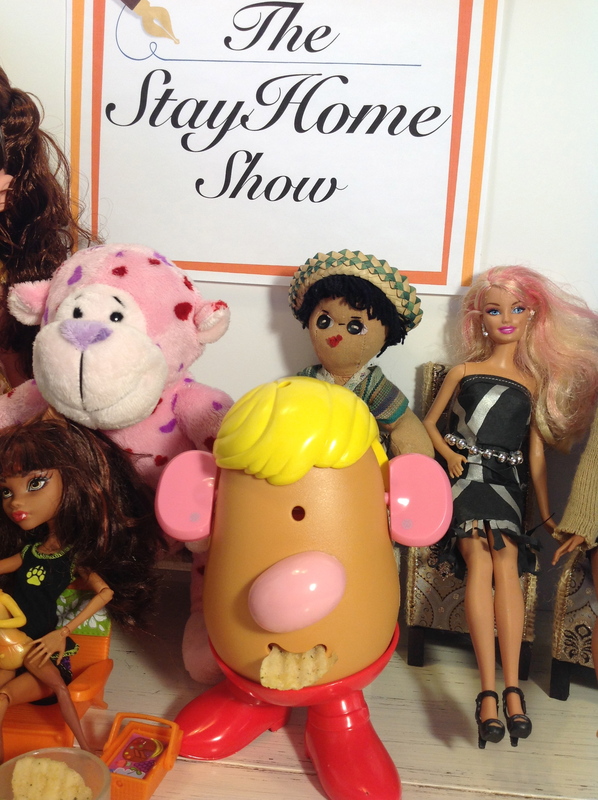 Potato, welcome to the Stay Home Show. Welcome, Welllcoooome! (Stay at Home laughs and drinks her beer while she waits for the audience to calm down). Mr. Potato, you seem to have quite a following. What do you attribute this to? How did you rise to this level? Potato: Well, I have been around for a while. (Potato laughs with the audience. “Duhhhh, what a stupid question,” they think to themselves). As a matter of fact, I’ve been around forever! 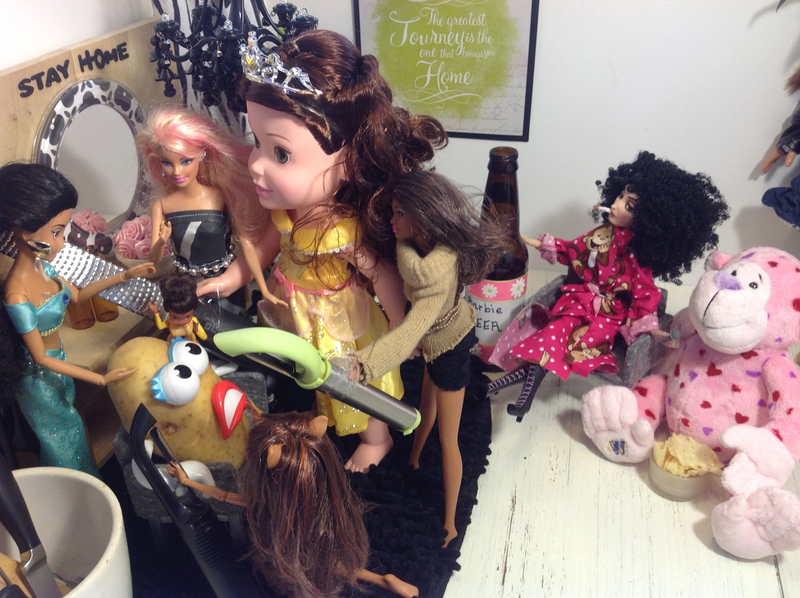 (Crowd and Potato still laughing at The Stay At Home Philosopher). Stay at Home: What do you mean you’ve been around forever? (Stay at Home feels stupid about the question she just asked. How is she supposed to know what a real potato is? Does anyone know what a real potato looks like anymore? Feeling backed into a corner, she decides to ask a hard hitting question to get her dignity back. She doesn’t know much about Potato but she does know her history). Are you hinting at the Irish Potato famine? Were you there? (audience goes silent). Potato: I’ve been blamed for good times and bad times throughout history and I took a lot of heat for it. No pun intended. (Audience and Potato laugh). Stay at Home: So you were there? Potato: Yes. I was there. (Audience goes into a more silent hush than the previous hush). Stay at Home: So what you are telling us today is that you are responsible for the death of millions and the invasion, I mean emigration, of the Irish, to the United States. (audience, most of whom are Irish, boooo Stay at Home). Potato: The Irish did depend heavily on me. That was their mistake, not mine. A lot of people would like to blame me for the blight, but it’s not my fault. It was a political and social problem. The same kind we have today. Stay at Home: Are you saying you’re not to blame for the death of millions with your rotted core and black leaves when you were the only thing that 80% of the Irish relied on? Potato: What I’m saying is that I’m just a potato. I’m delicious and nutritious. Loaded with vitamin C. There are so many things that can be done with me including starting a war. Stay at Home: I think we can all agree that you are delicious. Audience, raise your hand if you think Potato is delicious. (Audience raises their hands). But who said anything about a war? Mr. Potato, are you saying that the United States had something to do with the Irish Potato Famine? (Silence falls over the audience again). 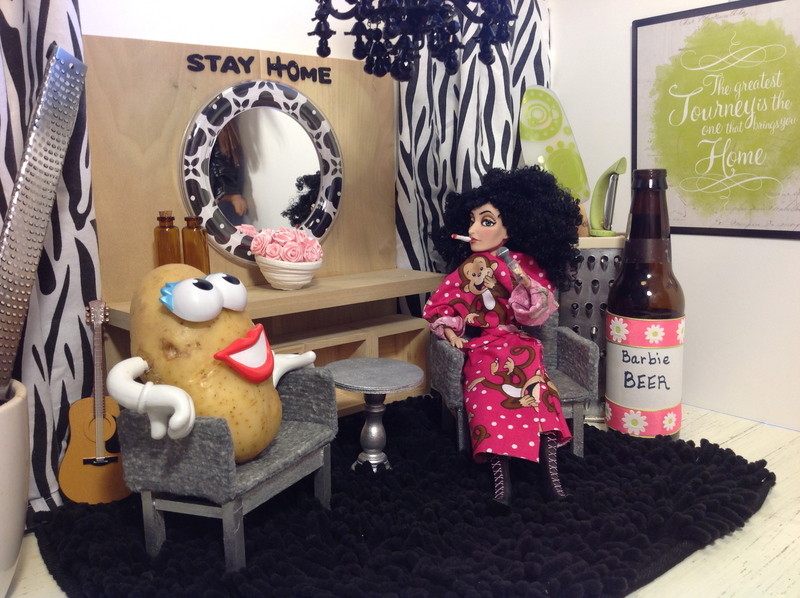 Stay at Home: And is revenge what you’re up to Potato? Did you reinvent yourself and make yourself with so many new and delicious flavors that Americans would become obese? (Mr. Potato remains silent). Answer the question Mr. Potato! (the audience demands answers as well). Potato: If I knew you were going to go in this direction, I would have prepared a better answer yesterpotato. All I can say, today, is that everyone would do well by taking 100% responsibility for all of history. The earth would progress much more quickly. The crowd goes into a frenzy and shreds Potato. Stay at Home: Thank you all for coming to today’s show. Tomorrow, we’ll be making hash browns. Our special guest will be Vegetable Oil. Have a wonderful night! I’m badly shredded but still alive! Have you Got a Spare Button?